If you want to try making your own 360-degree videos and pictures, you probably aren’t looking for a top of the line camera. You’re certainly not looking to drop thousands of dollars on one. Fortunately, there are some affordable options available to you. 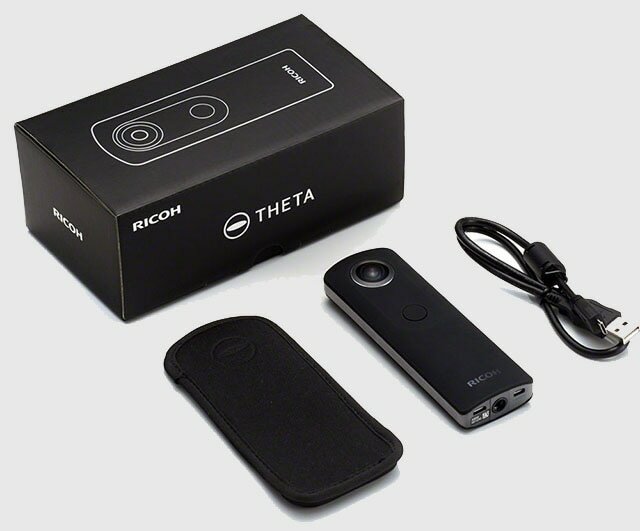 First, an offering from Ricoh, the Ricoh Theta S. This pocket sized camera costs around $350 and is super simple to use. It has exactly one button for taking photos or video. The camera can connect via USB or HDMI, but is also Wi-Fi capable, allowing you to transfer footage to your iPhone. This camera shoots at 14 megapixels, and 30 fps. There are several apps associated with it: one allowing you to edit your videos, as well as one that acts as a live-view feed and remote control to make shooting even easier. The 360fly 4k is a slightly more expensive option, retailing around $500. Unlike many other 360-degree cameras, it has only a single lens to capture its video, meaning that there is no stitching together of two images to create a seamless image. Like the Ricoh camera, it offers an app, 360fly to connect to your iOS device and act as a remote control. A second app, Livit, is offered to allow live streaming of your videos, along with editing. The 360fly camera is heavier duty than some of the other options out there, with a water, dust, and shock resistant body. It also offers a great image, with 2880x2880 resolution, 30fps, and a 240-degree vertical field of view. It also has some built in sensors, including a barometer, accelerometer, and a GPS sensor. Giroptic also makes a 360-degree camera, simply named the Giroptic 360cam, that retails for about $500. This camera uses 3 fish eye lenses and combines images into a 360-degree whole in real time. It has three built in microphones to capture sound and a gyroscope and accelerometer to stabilize images for videos, photo bursts and other types of footage. It offers slightly less resolution for video, about 2K at 30fps, but 4K for still images. The 360cam app, for iOS, lets you remotely control the camera over Wi-Fi, but also lets you view, edit and share photos and videos. Kodak, one of the older names in photography, offers the Kodak PixPro SP360 4K Action Cam. It relies on a dome-shaped, fixed focus 235-degree lens to capture 360-degree video. Starting at $449 from Kodak, this camera isn’t excessively expensive, though it’s also not the cheapest offering. It shoots 2880x2880 video at 30 fps. It can also shoot stills at resolutions up to 8MP. While not the best image quality among the camera offerings, Kodak’s camera is tough – resistant to water, dust, and shocks – making it a good choice if you find yourself on adventures where being careful with your precious camera isn’t always your first priority. The LG360 cam retails for around $200, making it one of the cheapest phones on the market, and was designed to work with the company’s G5 smartphone, though it also works with an iPhone. It captures 2K, 360-degree video and 5.1 channel surround sound, as well as allowing you to use only one of its two lenses for 180-degree image capture. It’s a small camera, with no built in display, but the companion app acts as a remote control and lets you view your recording in real time. The ALLie Camera retails for $499 and uses two fisheye lenses to take its 4096x2048 video. One interesting feature is the 10 built-in infrared LEDs that allow you to film in dark environments with a full 360-degree view. Its integrated microphone and speaker allows two-way audio, so that users can communicate. Its app lets you view the footage from anywhere and, if your mobile device has gyroscopic motion sensors, change your perspective while viewing footage by tilting and moving the screen. In addition to the app, recording and playback is available through the subscription-based ALLieCam Cloud. Panono, a spherical camera retailing for around $549 is unique in using 36 lenses to take 108 MP photos and videos, avoiding the use of wide angle lenses. It can be thrown safely, as well as supporting a universal mounting system. Final stitching together of the many images into a coherent photo or video requires sending the files to a cloud device, but the image quality more than makes up for it. Centr, a 360-degree cam funded on Kickstarter, retails for $399 and uses 4 110-degree lenses to capture its video. It has built in image stitching technology, meaning that users don’t need to use a desktop app or a cloud service to view the final video. It takes 20 MP photos and 4K video at 60 fps. One of the most expensive cameras in this line-up at around $800, Bublcam uses 4 110-degree lenses to take spherical photos and video. Taking 14 MP images and 1080p video, it’s a hit with photographers for image quality. In addition to this, it has stabilization features activated when the camera is in motion, to keep shaky camera work from ruining your video. Finally, Nikon’s upcoming Key Mission 360 camera is built for action. It’s a pocket sized device with dual lenses, and it’s meant to be rugged. Nikon advertises that it will be waterproof to 100 feet, and stand up to dust, shock, and cold. The app uses a simple swipe interface to let you get a panoramic view of everything you recorded. The expected retail price is $499. These 10 options are only some of the 360-degree cameras that are upcoming or already on the consumer market. Most of them cost a bit more than a new phone, and shoot pretty nice video. While the video and images can be enjoyed on your computer screen, VR headsets come highly recommended for getting the full effect. So get out there and try this new way of capturing experiences to share with your friends and family. The world awaits.